The Jeep display at the Guangzhou auto show in China in Nov. 2016. 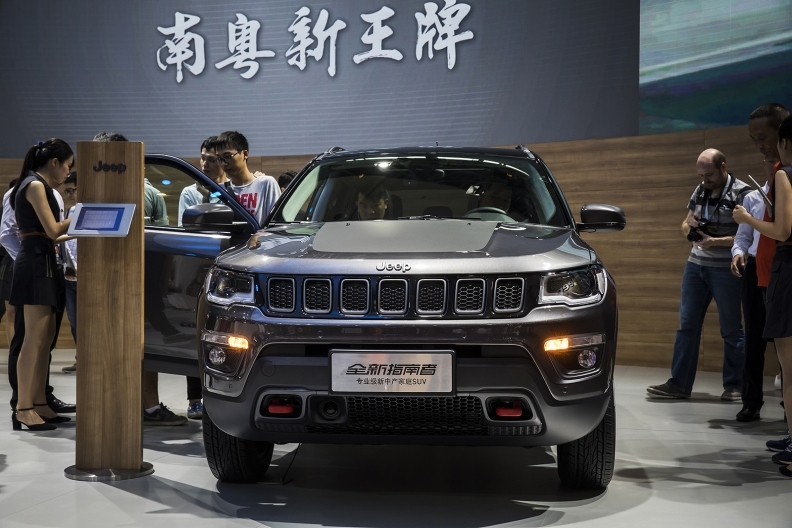 MILAN -- Zhejiang Geely Holding Group held informal talks about the potential takeover of Fiat Chrysler Automobiles before the Chinese manufacturer turned its attention toward Daimler, people familiar with the matter told Bloomberg. Li Shufu, the Chinese billionaire who controls Geely, approached FCA in the middle of last year as he was scouting for options to expand outside China, said the people, who asked not to be identified as the move wasn’t disclosed. Li opted not to make a formal offer as the two parties had different views on future valuations of Fiat Chrysler after the company’s five-year growth plan through 2018, they said. Representatives for Geely and Fiat Chrysler declined to comment. Automotive News reported in August that a Chinese automaker had submitted a bid for FCA, but that the bid was rejected for being too low. Automotive News did not reveal the identity of the Chinese automaker at the time. After the story ran, other Chinese automakers, including Great Wall, also expressed interest in some or all of FCA’s assets. Fiat Chrysler said in August it was “not approached” by Great Wall and that the automaker is "fully committed” to a five-year plan through 2018. Since the Automotive News story ran on Aug. 14, 2017, FCA’s U.S. stock price more than doubled, before retreating slightly this month. FCA shares were trading midday at $21.69, down 7 cents. Fiat Chrysler has a market value of about $33 billion. Having moved on from FCA, Li announced the purchase of a 7.3 billion euro ($9 billion) stake in Daimler last week. With that deal, Geely has become the German company’s largest shareholder, while the investment is the biggest by a Chinese company in an international automaker. Geely already owns Volvo Car AB and last year agreed to buy an almost $4 billion stake in truckmaker Volvo AB. As Geely and other Chinese automakers seek to expand in Europe and the U.S., FCA CEO Sergio Marchionne has been a vocal proponent of consolidation, arguing that the industry wastes money by developing multiple versions of the same technology. However, since General Motors Co. rebuffed his idea for a merger in 2015, the CEO has switched focus to cutting debt and has said the automaker no longer needs a partner. FCA is making progress toward a target to almost double profit by the end of this year from 2016, while the stock has also gained on speculation the company was seeking a combination with and was courted by Chinese competitors. The size of China’s car market has already surpassed the U.S. It’s one area where local companies like Geely and Great Wall Motor are encouraged by the government to go overseas to secure key technologies and access to resources. Automotive News contributed to this story. Ying Tian, and Ruth David also contributed from Bloomberg.